Much has been written about the life of Gideon Lincecum. Google him and see for yourself. A Wikipedia article begins this way: "Gideon Lincecum was an American pioneer, historian, physician, philosopher, and naturalist. Lincecum is known for his exploration and settlement of what are now the U.S. states of Alabama, Mississippi and Texas, which was then beyond the western borders of the Thirteen Colonies. Lincecum had good relations with American Indians as he explored the wilderness in the American Deep South...Lincecum was self-educated. He spent his boyhood principally in the company of Muskogees. After successive moves, he and his wife, the former Sarah Bryan, moved in 1818 with his parents and siblings to the Tombigbee River above the site of present Columbus, Mississippi." The Handbook of Texas Online continues with, "From there in January 1835 Lincecum joined an exploring expedition to Texas. 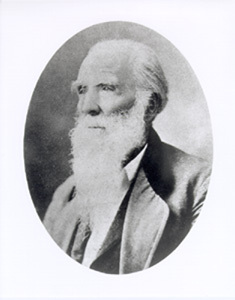 In 1848, after years of practicing medicine with herbal remedies learned from Indians and trading with the Indians on the Tombigbee, he moved to Texas. He purchased 1,828 acres of the fertile prairie land he had seen on his Texas visit thirteen years before. Lincecum, Sarah, and their surviving ten children, a number of grandchildren, and ten slaves arrived in Long Point on his fifty-fifth birthday." Aside from his much documented and highly respected work as a naturalist, Gideon was a friend to the Native American Indians when few were. He befriended them, learned from them, and chronicled their culture and traditions. Something else Gideon was that is not always focused on is this: he was a free-thinker. "Freethought" is a philosophical viewpoint that holds that opinions should be formed on the basis of science, logic, and reason, and should not be influenced by authority, tradition, or any religious dogma. Gideon was not fond of organized religion, and I am quite sure his opinions were controversial in his day. In fact, many would find them just as much so today. If Gideon were still with us, I believe he would definitely be a blogger -- with some dedicated followers and just as many or more haters. 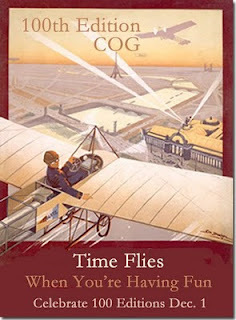 Here is a sampling of Gideon's "free thoughts:"
When I was a very young man I read Dr. Franklin's works. He advised early marriage and that advice, agreeing with unchecked and misdirected amativeness, it was an easy matter for me to fall in with the old sage's directions. Accordingly, I sought out a companion and was engineering the matrimonial machinery before I was 21 years of age. The result is ten families of grown-up men and women, with their children, numbering together 61. I do not repine or regret anything about it, but I cannot avoid the recollection of the fact that in rearing this numerous brood, who average only from ordinary to middling, I lost 38 years of a life that could have been better employed. For the world is as full as it can hold of precisely the same sort of folks and there was no use in adding my brood to the already overdone business. To beget and born children in the name of the Lord has not and cannot improve the intellectual developments of our species -- it must be done scientifically and philosophically before there can be any intellectual and moral advancement. G. W. Lincecum is married. Society, if she knew her rights and had the courage to maintain them, would never permit such conjugal unions as that. What part of your society compact will he and that Seed gal ornament? Who will feed them? Stick to the truth in all things, keep sober and freely perform your share in all necessary public works and there is no danger. I know, for I have tried it through a long life and declare positively to you that I never had a man to make use of a rough angry word to me in my life...I have always expressed myself freely and openly on all and any subject, particularly on the subject of religion, its gods, devils, holy ghosts and the whole of the ghost family...We may speak freely of doctrine and principles, avoiding personalities...and we shall seldom offend a man whose friendship is worth cultivating. Gideon Lincecum died at the age of 81. News of his death was published in the New York Times under DEATH OF AN ABLE AND ECCENTRIC MAN. He "was buried by the side of his good companion in the old Mount Zion Cemetery near the Lincecum home in Washington County, Texas. Sharing his grave, at his request, was his precious old black violin. Here, in a neglected graveyard covered with shinnery, Gideon rested for sixty-two years, forgotten but in peace. In 1936, the year of the Centennial of Texas' Independence from Mexico, there was a wholesale disinterment in commemoration of the event. Gideon Lincecum was one of the victims. The remains of his body and his old violin were removed to the lovely little State Cemetery in Austin, Texas, and placed in a grave in Row One of the Austin plot, so called because it is dominated by the grave of the Father of Texas. 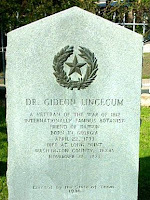 In spite of his controversial beliefs, Gideon Lincecum was regarded as a man of honor dedicated to the betterment of society. Though there are many "questionable" quotes above, I could also show you examples of Gideon's love for his family and community. His lasting legacy lives on to this day. dedicated to the memory of Terry Thornton.